The useful life of upholstered furniture can be increased if the consumer follows a few simple fabric protection rules. It is important that a fabric be chosen that is appropriate for its intended use. Weekly vacuuming or light brushing is a fabric care tip that helps to remove soil and protect fabric from the embedding of dirt or grime between fibers which can increase abrasion and wear. The life of upholstered cushions can be increased through periodic turning. The weekly reversal of loose cushions will allow even distribution of wear over a long period of time. Fabric protection helps to increase the useful life of upholstered furniture by protecting fabrics from soil and stains. Some fabric protections are mill applied and others can be applied in the store or at home. A protective finish does not eliminate the necessity of proper fabric care. It modifies the absorbency and soil removal characteristics of a fabric. It does not put a plastic cover on it. Loose dirt should be vacuumed and brushed away before it becomes embedded and harder to remove. Spills and stains should be cleaned away quickly following manufacturer's fabric care code instructions for furniture cleaning. W: Spot clean with the foam only of a water-based cleaning agent such as mild detergent. S: Spot clean using solvent only. Use sparingly in a well-ventilated room. Use water-based solvent cleaners. They may cause spotting and/or excess shrinkage. Water stains may become permanent. S-W: Spot clean with solvent or water-based foam. X: Clean fabric only by vacuuming or light brushing to remove soil. Do not use liquid cleaning agents of any type. Blot up stains as quickly as possible. Do not rub. Prompt attention to stains increases success in removing them. Even stain-resistant finishes offer only temporary protection. If you are not sure about how to clean your furniture, or the codes are not available, it may be best to call a professional cleaner. 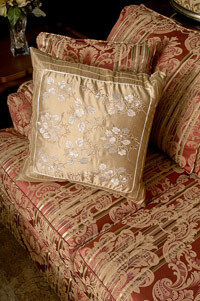 You can also purchase upholstery protectors to keep your furniture from becoming stained or dirty. If you buy your furniture brand new, the fabric is generally pre-treated. However, over time this protection will wear off, and used furniture will likely not have it. The furniture industry recommends professional cleaning when overall cleaning is necessary. The cleaning code should be called to the attention of your professional cleaner. A part of the instruction for each code designation is Caution: Never remove cushion covers for separate dry cleaning or washing. Any cleaning method that requires the removal of the covers from the cushions can destroy the backing, shrink, or otherwise damage upholstery fabric.